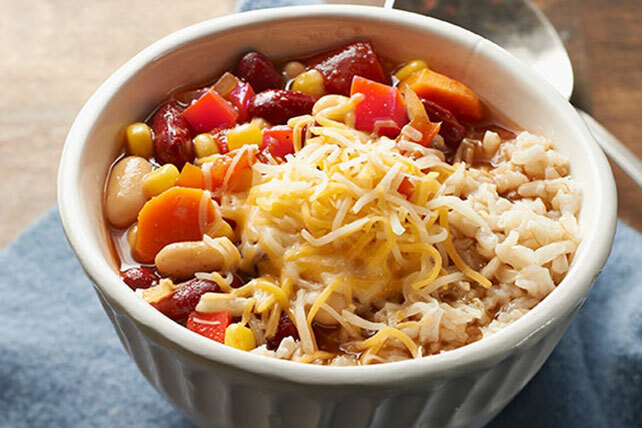 Warm up with a bowl of our Healthy Living Two-Bean Vegetarian Chili! This easy-to-make vegetarian chili features a balsamic vinaigrette flavor boost. Meanwhile, heat dressing in large saucepan on medium-high heat. Add carrots, onions, peppers and garlic; cook and stir 6 to 8 min. or until vegetables are crisp-tender. Add all remaining ingredients except corn and cheese; stir. Bring to boil; simmer on medium-low heat 30 min., stirring occasionally. Stir in corn; cook 5 min. or until heated through. Serve chili over rice; top with cheese. For a touch of heat, add up to 1 Tbsp. ground red pepper (cayenne) to cooked vegetables along with the tomatoes, beans, barbecue sauce and chili powder. Substitute 1 undrained 28-oz. can diced tomatoes for the 2 smaller cans.